The country music community has been lamely arguing over whether Beyoncé’s ”Daddy Lessons” belongs in the genre since it was released. 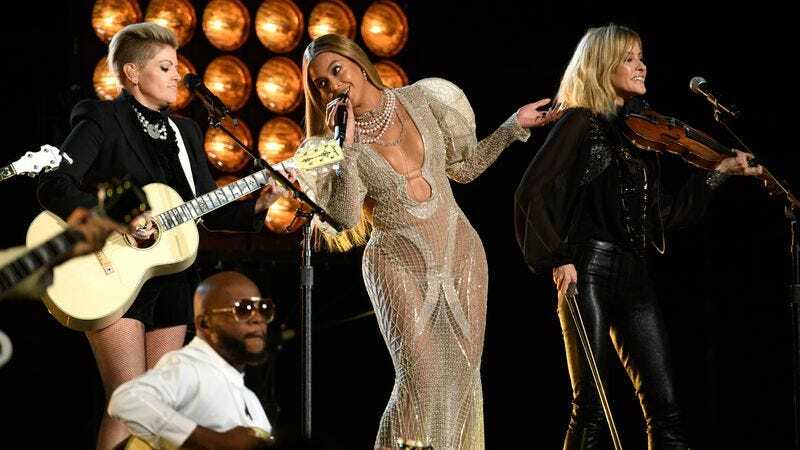 This rather ridiculous conflict came to a head when the star performed the Lemonade track with the Dixie Chicks at the Country Music Awards. Well, now the Recording Academy—the body that runs the Grammys—has weighed in. Its verdict? Not a country song. According to a report in the Associated Press, Beyoncé attempted to wade into the country categories by submitting ”Daddy Lessons” as such, but the country music committee rejected it. Beyoncé still ended up with the most nominations of any artist when the contenders were announced earlier this week, and Lemonade’s vast array of styles was recognized. “Don’t Hurt Yourself,” which she performs with Jack White, was nominated for Best Rock Performance, “Freedom” with Kendrick Lamar for Rap/Sung, and “Hold Up” garnered pop recognition. That makes the country committee’s decision all the more curious, especially given the earlier controversy.